The Water Care Partnership is a group of partners that have been brought together through the Catchment Based Approach (CaBA) to deliver the aims of the Water Framework Directive (WFD) in the Old Bedford and Middle Level Catchment. Cambridgeshire ACRE are the catchment hosts and administer the partnership. 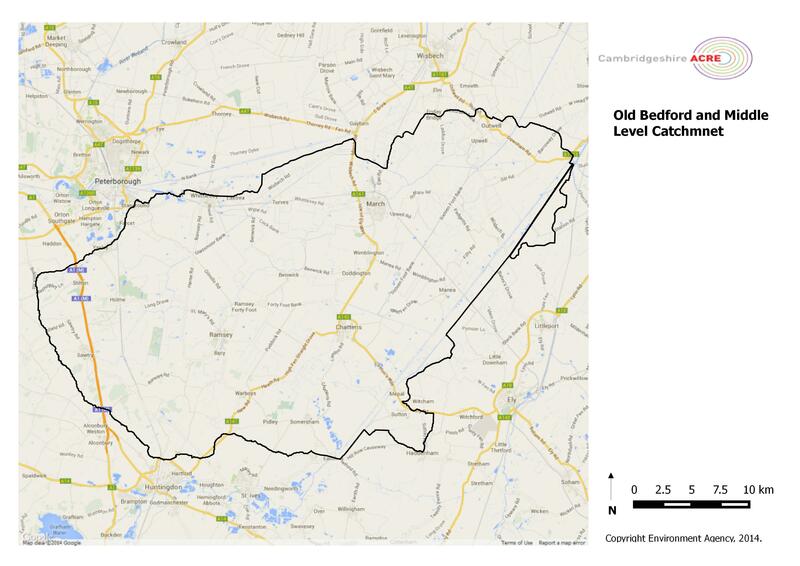 The Old Bedford and Middle Level Catchment is catchment 55 of Defra’s 100 water catchments (please click here for a map of all 100 water catchments). The Old Bedford and Middle Level is a unique and challenging catchment with many different issues. The catchment is located in the Cambridgeshire Fens and so is a low-lying flat, landscape much of which is below sea level meaning that water within the catchment is carefully managed through drainage ditches and rivers. The nature of the rich fertile, peat soils mean that the predominant land use of the area is agriculture. The catchment also contains market towns such as Whittlesey, Ramsey, March and Chatteris. The Old Bedford and Middle Level has a unique landscape with The Ouse Washes to the south of the catchment and the Great Fen on the west side of the catchment. The area has an array of habitats which supports diverse wildlife including fish, otters, water voles and many varieties of birdlife. A map of the catchment can be seen below. The Water Framework Directive (WFD) is a piece of EU legislation that became legal in 2000, it requires the ‘good status or potential’ of all waterbodies, including surface and groundwaters. This means that lakes, rivers, tidal estuaries, coastal waters and groundwaters will support and maintain a good level of wildlife. A good status or potential is achieved if the environment for the wildlife is as close to natural as possible. To find out more information about the WFD, please click here. The Catchment Based Approach (CaBA) is a Defra funded initiative which aims to get local communities and stakeholders involved in protecting and enhancing the local water environment. The Catchment Based Approach is important because local stakeholders and communities know and understand the catchment. This approach targets actions that are a priority for the local community and allows local communities to get involved in improving their water environment. What are the Main Issues in the Catchment? The catchment varies greatly in its needs and therefore there are a range of issues that are impacting watercourses in the Old Bedford and Middle Level. As the predominant land use of the area is agriculture, rural diffuse pollution is a common problem throughout the catchment. However, the large market towns in the area result in urban diffuse pollution and point source pollution from sewage treatment works. The nature of fenland watercourses are also an issue. Most of the watercourses within the catchment are artificially modified and this can have a damaging effect on the wildlife in the rivers. Fenland watercourses are also naturally slow flowing, which can lead to problems with the amount of dissolved oxygen that is available in the water (to find out more about dissolved oxygen, please click here or here). There is a known issue with dissolved oxygen, which leads to fish kills on the Ouse Washes.